This large bowl with great presence is from the Islamic Nupe people of central Nigeria and probably was executed in Bida. 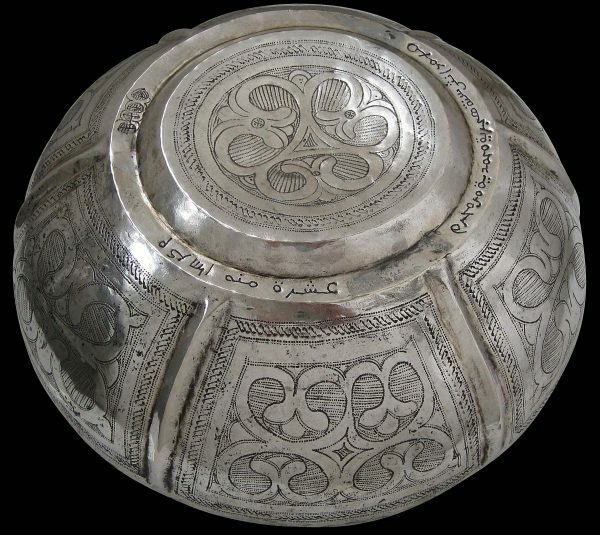 The base is engraved in a version of Sudanic Arabic that is used in Nigeria, possibly giving a maker’s name and/or the owner, as well as some symbols. A silver bowl attributed to Islamic Nigeria with similar engraved work is illustrated in Al-Jadir, S., Arab and Islamic Silver, Stacey International, 1981, p. 81. Al-Jadir, S., Arab and Islamic Silver, Stacey International, 1981.